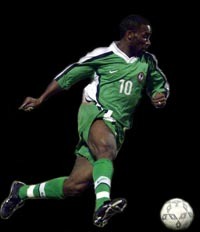 The 2002 FIFA World Cup is underway and can be described as the world's premier sports event. FIFA, the FIDE-equivalent of international soccer, hosts the World Cup every four years, and the event features the world's best "footballers" from each country. Think of it this way… each team features a "Dream Team" of soccer players who play in the best professional leagues around the world. Soccer and chess are cousins in a sense that both require different offensive and defensive systems, different game phases and time management. There is also strategic execution, flank attacks, and spectacular combinations leading to a point. Despite obvious differences, can the apparent similarities between these sports transfer to the other? Perhaps Norwegian GM Simen Agdestein can best answer this question. 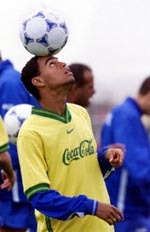 GM Adegstein was once a world-class soccer player until a serious injury sidelined a promising career. Jamaica's Mark Bowen's recent article on "lateral thinking" brings to light how one can instill values of one sport into understanding more about chess. Perhaps if one would take notice of players like Brazil's Rivaldo, one can understand the passion of a player like GM Garry Kasparov. In addition, if one can study the ball-handling skills of Brazil's Denilson (pictured left), Nigeria's Augustine Okocha (above right), or France's Zinedine Zidane, we could understand the motivations for the world's most creative chess players such as GM Alexei Shirov. Chess players are encouraged to watch these World Cup games with particular emphasis on teams like Germany, Spain, Brazil, Argentina and Nigeria. Notice their contrasting styles and how they organize their attacks, counterattacks, and defenses. It's the same principles as one would see in a match between the top chess players in the world. Check out the games… certainly you'll be in for a treat!